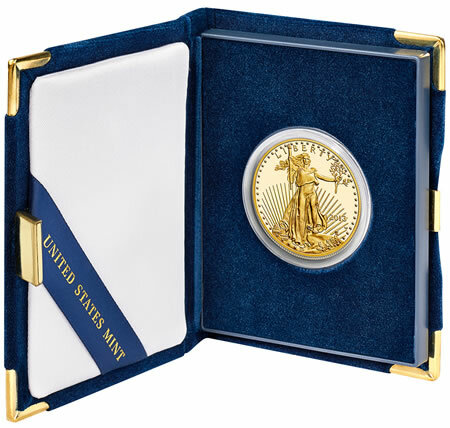 Available now from the United States Mint are this year’s 2013-W Proof American Gold Eagle Coins. The coins went on sale today, April 18, 2013, and are available in four sizes and a four-coin set. Proof American Gold Eagles are offered by the U.S. Mint as numismatic versions of its popular bullion Gold Eagle program. The proof and bullion coins made their inaugural debuts in 1986. Twenty years later, the U.S. Mint unveiled a third line-up in the program with its uncirculated American Gold Eagle. All three versions feature the same basic obverse and reverse designs. Shown on the obverse is Augustus Saint-Gaudens’ Liberty design. Lady Liberty’s hair is flowing as she holds a lit torch and olive branch. The design also has background and encircling elements of the U.S. Capital building, rays of rising sunlight and 50 stars. Produced at the U.S. Mint at West Point, there is a denoting ‘W’ mint mark below the year. Found on the proof’s reverse is Miley Busiek’s popular design of a "Family of Eagles." 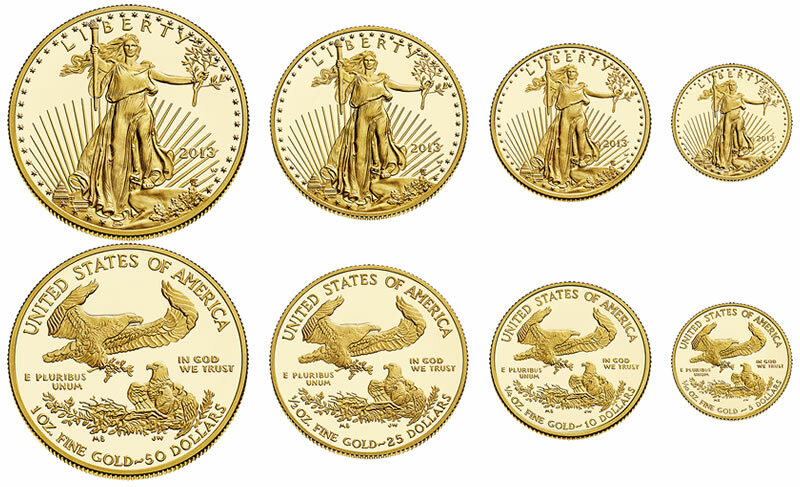 Proof American Gold Eagles are struck from 22-karat gold in sizes of 1 ounce, 1/2 ounce, 1/4 ounce and 1/10 ounce. These correspond to the respective denominations inscribed on reverses of $50, $25, $10 and $5. Prices for U.S. Mint numismatic gold products may be adjusted weekly based on the prevailing trend of gold. The Mint uses a pricing matrix which ties each coin’s price to a weekly averaging of the London gold Fix. Pricing reviews occur on the Wednesday of each week with adjustments made, if needed, that same day. If the proof American Gold Eagles had launched one week ago, they would have been $100 higher per ounce of gold content. Should gold remain in the same area today through to next Wednesday, averaging between $1,350 and $1,399.99 an ounce, Gold Eagle prices would fall another $100 per ounce of gold content. Mintages, product limits and debuting prices are listed in the table below. 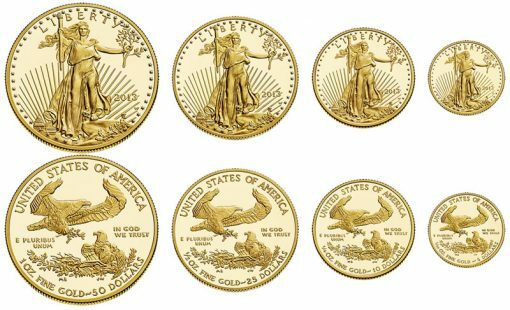 Last year’s proof American Gold Eagles opened at sales prices that ranged from $215.50 to $3,585.50. The prior year prices initially ranged from $195.50 to $3,215.50. With the exception of the 1/2 ounce Gold Eagle’s product ceiling, the above limits all represent declines from amounts announced last year. For example, no more than 20,000 of the four-coin sets will be issued this year. Last year, the product limit for the four-coin set was 30,000. This lowering of mintage and product limits was likely established to better reflect anticipated consumer demand. Orders for the collector proof coins may be placed on the U.S. Mint’s online product page located here. Telephone orders are also accepted at 1-800-USA-MINT (872-6468). There are no household ordering limits. Mentioned earlier, this year’s 2013-W Uncirculated American Gold Eagle is scheduled to launch in June. Did someone say that due to price averaging, the Mint may reduce gold eagle proof prices further this coming week, even if gold remains steady or advances a little?